This is a very cool guitar pick necklace! I used a gorgeous gun metal gray guitar pick in my design. I added beautiful wings and sweet little silver cross to symbolize how music lifts your spirit. 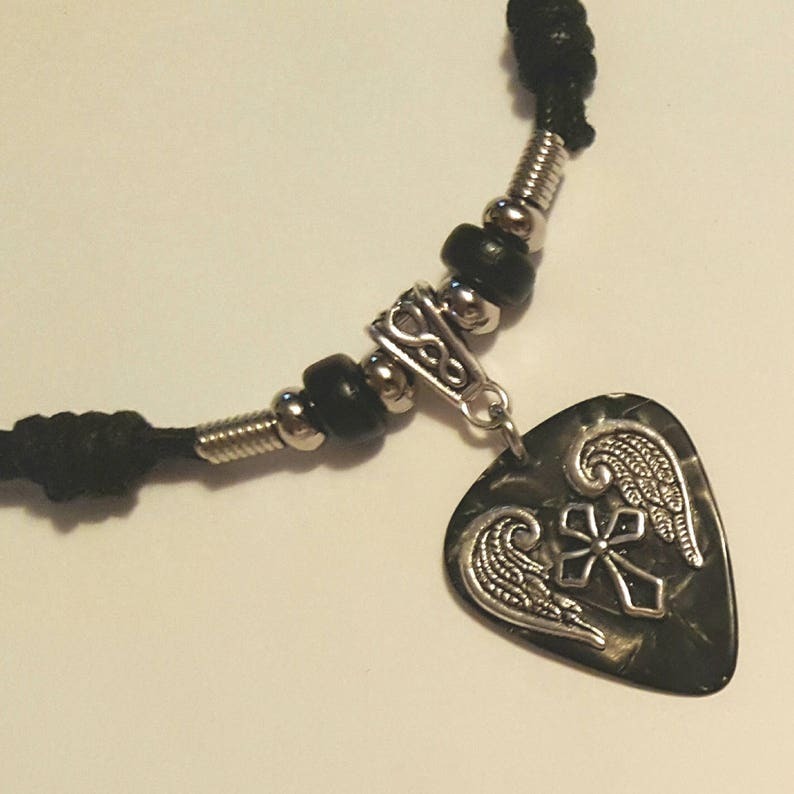 This Guitar pick necklace can be worn as a *Necklace* or a *Bracelet* and it is strung on durable waxed cotton cord and has black ceramic beads. This guitar pick necklace has metal springs and metal beads to add contrast to this piece. Looks really sharp! I have used a slip knot design on this guitar pick necklace, so it's adjustable and great to give as a gift! Measures: 18 inches at the smallest diameter adjusts up to 24 inches. Another great idea for this guitar pick necklace would be to take it with you to your next concert and throw it up on stage for your favorite guitarist/singer! =) It's a lot better than roses! Or...if you are a musician in a band, you could throw it out to the crowd at the end of the night! It's better than just throwing out a pick or perhaps you'll just love it too much to part with it! Beautiful necklace as described. Perfect shade of purple. It was a gift for my daughter and she loves it! If an item is damaged by the Post Office, then you can contact them...make sure to take pictures of the packaging before it is opened. If an item is broken in shipping, due to poor package on my part, which has never happened to my knowledge, you can contact me and we will work something out to get the item repaired or replaced...notice...I must be contacted immediately upon receipt of the item if there is any problem. You are welcome to convo me prior to the purchase of any item if you have any questions. **I ship all of my items First Class Mail usually the day of order or the following business day and it usually takes between 2 to 5 days to arrive. If shipped out of the United States it could take a few weeks to arrive, depending on the speed of customs. I do used a 6 x 9 bubble wrap envelope for extra protection of your item during shipping. If you want insurance, please let me know at the time of purchase, there will be an additional charge. I am open to wholesale orders, so feel free to contact me with any questions or comments!